The free market reforms that Cuba undertook in the wake of the collapse of the Soviet Union have propelled the country into uncharted waters as it improvises to find solutions to its economic crisis. The harsh realities of a world without the massive Soviet aid on which Cuba had become so dependent forced the government to tolerate considerable reductions in the state’s control of the economy. However, the market reforms of the 1990s are not the first free market experiments that Cuba has conducted to try to alleviate the problems that its highly centralized socialist economic model generates. The island has flirted with capitalist concessions since the revolution and has seemed to alternately embrace and reject limited economic openings throughout the socialist period. The desire to spur employment and provide for Cuban consumers has run into conflict with Fidel Castro’s devotion to socialist ideals and his need to prevent an entrepreneurial class from challenging his political hegemony. A perennial, politically charged balancing act between the drive for efficiency and adherence to socialist principles has been the result. This paper describes the reforms, it attempts to understand their logic, and evaluates their impact. The main conclusion is, that in contrast with the liberalizations of 1985, the current reforms are here to stay. An examination of earlier Cuban reforms reveals that they foreshadow the 1990s reforms. Free peasant markets, the legalization of certain kinds of private enterprise, and the liberalization of real estate sales are examples of recent Cuban reforms that had been instituted in years past, then backed away from, for various ideological and practical reasons. These antecedents can be seen as part of a cycle in which reforms are tolerated until, perhaps inevitably, they produce results that are anathema to socialist ideals. When income inequality, corruption, and profiteering reared their heads in Cuba in the mid-1980s, the Rectification Process was initiated and capitalist openings, such as the peasant markets, were closed down. Cuba has certainly witnessed greater changes in recent years than those which brought about the Rectification Process, and those changes have challenged some of the basic tenets of Cuban socialism. Furthermore, Castro is firmly in control and remains a committed socialist. Will the pendulum swing back toward a more thoroughgoing socialism? How do the current reforms compare with earlier ones? Since the 1959 revolution in Cuba, the agricultural sector has been at the forefront of most economic activity not entirely dictated by the socialist model. Indeed, private farms have existed throughout the history of modern Cuba. The 1959 Agrarian Reform Law created private farms; many of the farmers who received land were sharecroppers and tenant farmers before the revolution. These farms number about 102,000 and range in size from 20 to 60 hectares. Until 1980, the private farmers sold their products to the government, which controlled the distribution, wholesale and retail of the goods. In 1986, approximately seven percent of arable land in Cuba was in private hands, 13 percent was owned by cooperatives and 80 percent was owned by the government. The private farms have had consistently higher productivity rates than the government-run farms, despite the fact that they generally have less access to fertilizers and machinery. By 1980, Cuba’s centralized system had produced bottlenecks and inefficiencies that hurt the agricultural sector’s ability to meet production goals. Some of the shortcomings of the planning system, the Sistema de Dirección y Planificación de la Economía (SDPE), were obvious to Cuban officials. Modeled after Soviet planning systems and intended to improve efficiency through the introduction of an economic accounting system and certain profitability incentives, the SDPE was hampered in this effort by centrally fixed, static prices, which did not allow optimal resource allocation or production choices. Input shortages had become rampant and were aggravated by enterprises’ hoarding in response to uncertain supply. Cuban agriculture had suffered under the rigidities of the SDPE, and authorities turned to further decentralization to redress the problems. To alleviate food shortages, the government legalized free farmers markets, or mercados libres campesinos (MLCs), through Decree 66 approved by the Council of Ministers in the spring of 1980. By the mid-1980s, 250 such MLCs had been established. Private farmers were permitted to sell their products at the MLCs at free prices, provided they first met quotas for sales to the government. The MLCs undercut the black market and alleviated some shortages. Cubans flocked to the markets and enjoyed the greater variety that they offered, though complaints of high prices were common. Meats such as chicken, rabbit and lamb (beef was still controlled by a state monopoly) and vegetables and fruit became more readily available to Cuban consumers almost overnight. The government had hoped to improve the productivity of state-run farms and thereby be able to sell at lower prices than the private farmers if their prices climbed too high. The private Cuban farmers, however, proved to be adept at working this small capitalist opening to their advantage; they closely monitored what the state stores were offering and then brought to the free markets goods they knew were not available from the government. The ensuing sellers’ market drove prices up and led to allegations of widespread corruption. In 1982 government investigators cracked down on the markets, arresting 165 people for “irregularities,” including involvement of middlemen in the markets and the sale of products stolen from the government. The Cuban Domestic Commerce Minister at the time, Manuel Vila Sosa, claimed that 60 percent of the goods sold at the MLCs had been stolen from the government. After the crackdown, government controls were imposed on the peasant markets, including a 20 percent sales tax and a progressive income tax ranging from five to 20 percent. Despite the stricter controls, the markets continued to thrive. Free market reforms affected other sectors of the economy as well in this period. 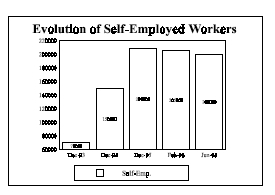 In 1978, limited selfemployment was first allowed by the state. Certain professionals such as carpenters, plumbers, electricians and artisans were allowed to work privately, provided they had fulfilled their time commitment to the state first. Those who were able to buy a state license could essentially go into business for themselves. They charged whatever rate they could get, and payment was often made in kind with goods such as chickens or vegetables. They were not allowed to hire any staff, but they could form business alliances with colleagues. The 1978 legalization of self-employment was considered an attempt to control what had been occurring for quite some time. Artisans and handymen had seemingly always worked outside of the state apparatus, risking detention by the authorities as they attempted to improve their standard of living. Even after the 1978 reforms such work was a potentially dangerous proposition. 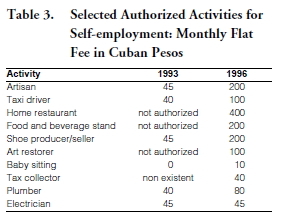 The state strictly controlled the number of licenses issued for private work, and crackdowns such as the trial of a score of artisans in a public square in Santiago de Cuba in June of 1985 for selling jewelry without a license, were common. The government instituted other changes that brought a degree of flexibility to the economic system. In 1979, “resource fairs” were embraced as a way to deal with the growing stocks of unused inputs within enterprises. The state allowed enterprises to trade directly with each other as a way to overcome inefficiencies and errors committed by the State Committee on Technical-Material Supplies, the central organization for resource allocation. 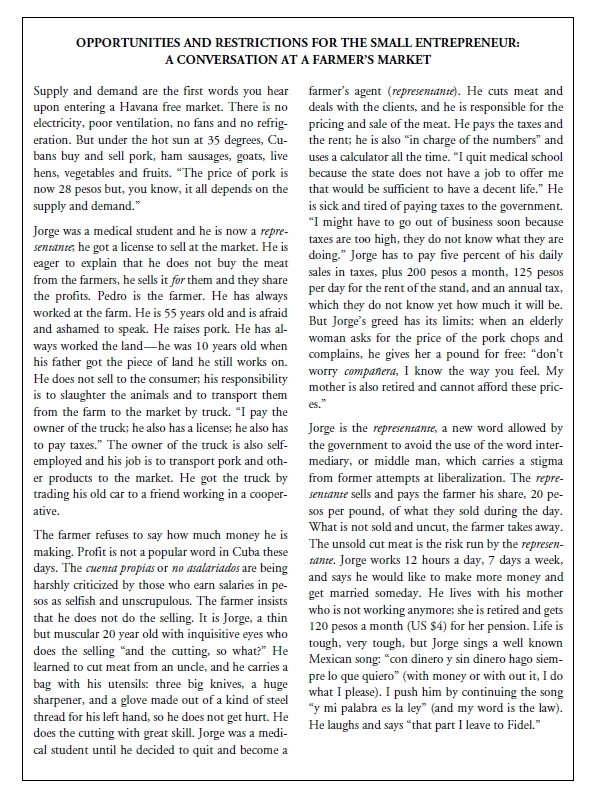 In 1980, 40 million pesos of inputs were traded at the fairs. The record of wage incentives in Cuba reflects the general pattern that capitalist reforms have followed in the country: they were adopted, then disavowed when it was determined that they were undermining socialist ideals, then adopted again when economic realities demanded it. In 1967, authorities believed that a communist consciousness had been gained which obviated the need for wage incentives, and incentives were abandoned. The resulting fall in productivity and standards of living produced another reversal; in 1973, wage incentives were reinstated. Another significant development in Cuba that anticipated the market reforms of the 1990s was the passage of decree-law 50 in 1982. This law permits foreigners to own up to 49 percent of local businesses, to control labor, pricing and production policies, and to repatriate profits. The law was structured to compel international investors to bear more risk than would be the case if finance capital were invested. Negotiations for some investment projects with Canadian and West European companies were initiated after decree-law 50 came into effect, but pressure from the Reagan administration on potential investors limited the benefits of the law. Decree-law 50 was the base upon which the current foreign investment environment was created; in 1992 it was expanded and became a cornerstone of Cuban economic policy. Other noteworthy liberalizations were effected during this period as well. In 1984, Cubans who rented apartments from the government— the majority were city-dwellers— were allowed to own them; rent payments were converted into mortgage payments. Furthermore, individuals could sell housing to private citizens for the first time, and the construction of private homes was legalized. Construction materials became easier to obtain, and a housing and construction boom ensued. By 1986, these reforms had generated considerable tensions in Cuban politics and society. The MLCs and the liberalized construction materials market, for example, diverted valuable resources from state to private uses. The specter of the much-hated “middleman” had arisen in the MLCs, persons who would exploit the free farmers’ lack of transport by buying produce cheaply in the countryside, then bring the goods to the cities to sell at a hefty profit. Income differentials were becoming more obvious to Cuban citizens, as truck drivers typically made many times more than what physicians were earning. Housing law reforms unleashed a speculative boom in real estate, and prices shot up. Government officials were concerned about the negative effects the reforms might have on the people’s socialist fervor as well as the undue influence that might be gained by the beneficiaries of reform. At the same time, however, the government fully realized the positive economic impact of liberalization. Indeed, the need for further decentralization had been described in various government documents and speeches in the months preceding the 1986 Third Congress of the Cuban Communist Party, particularly at the 1985 Fourth Plenary session. The Third Party Congress was the scene of vigorous discussions over the direction that the economy should take. The role of material incentives in a socialist system was once again the subject of fierce debate in Cuba. Economic realities precipitated a turn toward a more orthodox brand of socialism. In 1986, a 2 percent growth rate, low sugar prices, and several years of drought combined to deplete Cuba’s hard currency earnings by almost 50 percent, or $600 million. Cuba’s failure to secure a new $300 million loan at the Paris Club meetings that summer exacerbated the crisis and produced a serious shortage of imported inputs, which in turn greatly reduced outputs in the economy. Material incentives were weakened by a lack of goods to spend money on. The lack of foreign exchange stalled the impetus for further changes as the government tried to marshal all the resources it could, to complete several long term investment projects. The result was a period of renewed socialism and a rejection of many of the capitalistic openings of the late 1970s and early 1980s known as the Rectification Process. There was clearly a political and ideological element in the government’s turnabout as well. Corruption had infected all levels of the bureaucracy to some extent. A political purge which saw some of the veterans of the revolution ousted was initiated simultaneous with Rectification. Volunteerism was revived with the resurrection of the “micro-brigades” of unemployed and temporarily laid off workers, originally a Guevara innovation. Castro, who visited North Korea in 1986 and was impressed by that country’s hard line Communism, adopted a more virulent anti-capitalist tone, reminiscent of the early days of the revolutionary period. Other free market openings were abandoned as well. The 1984 housing law was amended to give more control to the state and halt the speculation and corruption that had arisen. The regime decreed that all housing sales must be approved by a state agency that would regulate prices. The government began again to exercise its legal right to buy all housing for sale on the market. Also in 1986, Castro labeled the thousands of selfemployed Cubans “corrupt parasites” on the public sector and curbed their activities with tighter regulations. In an effort to gain greater control over resources, the government imposed a system in which taxi drivers, artisans, and street vendors and private service workers such as plumbers and electricians had to obtain all materials via a state-issued certificate. The number of private wage workers and workers for their own account fell from 52,100 in 1985 to 43,200 in 1987. In monetary terms, private nonfarm incomes fell from 102.5 million pesos to 67.8 million pesos in the same period. During the Rectification Period, wage incentives for the population as a whole were also scaled back. We have seen many of the free market reforms of the 1978-1985 period adopted once again in the 1990s. MLCs have been reinstated, private enterprises and occupations have been legalized to an unprecedented extent, foreign investment is being actively courted. Accompanying these changes are the conditions that prompted the abandonment of free market reforms in 1986. Inequalities are even more drastic today because Cubans are allowed to hold dollars and a dual economy has resulted. 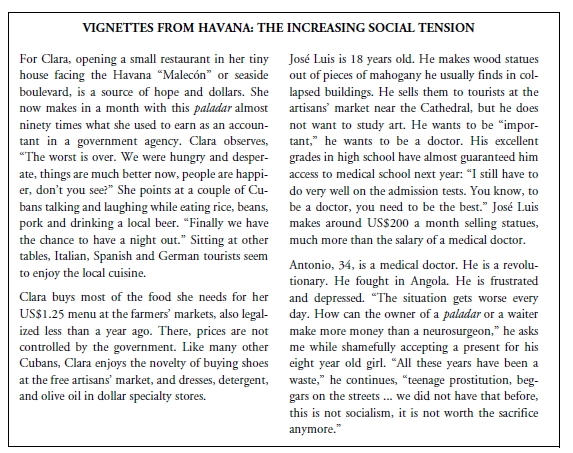 Those Cubans with jobs in the tourism sector or with well-off relatives in the United States typically live far better than physicians, scientists and others who have been most loyal to the regime, a situation that spawns deep resentments. A new generation of Cubans that missed the heady early days of the revolution and is witnessing increasing inequality, has begun to press for change, as have other sectors of an emerging civil society. According to the formula that has established itself, the time is ripe for a backlash against these market oriented tendencies. Our main thesis in this paper is that some key differences between the Cuba of 1986 and that of 1996 preclude any such reversal today. In the 1980s, economic openings were attempts to ameliorate the systemic scarcity, inefficient investments, and widespread waste that typically plague centrally planned economies. Cuban officials experimented with the reforms, but even the MLCs never had a major impact on the workings of the economy. Cuba was experiencing the end of a period of relative prosperity in 1986 and was still securely dependent on heavily subsidized trade with the Soviet Union. In the 1990s, however, the collapse of Soviet Union has altered the playing field dramatically. Free market reform, once a tentative experiment, is now Cuba’s lifeline. Cuba is attempting to fill the gaping hole left by the removal of Soviet patronage with foreign investment and tourism, and reforms are necessary to develop these sectors and assure an influx of foreign exchange. Further, material incentives are more effective as previously unavailable goods can now be purchased at dollar stores. Without a generous and forgiving sponsor, Cuba has no choice but to become more efficient and insert itself into the international system in order to survive. This requires economic reforms, from which there is no turning back. Driven more by external reality than any internal conviction, Cuban policy makers have been introducing market reforms since 1989 in order to adjust to major changes in external trade relations. One of the most controversial results of these changes has been the emergence of the small Cuban entrepreneur, the capitalist expression of a socialist defeat. Already fighting for survival after three years of continuous growth and expansion, this small private sector is currently targeted by the tax authorities and followed with suspicion by the communist party leaders. Nevertheless, in spite of some conflicting signals received from the government— reflecting the contradictions of the current system— we will argue that the Cuban entrepreneur, this time around, is here to stay. We are not an economy in transition, nor are our people or our party in transition towards capitalism. We will make the changes that are necessary but we will never make a single concession. As a consequence, exports plunged from $5.4 billion in 1989 to $1.7 billion in 1993 due mainly to the collapse in sugar production, which fell from 8 million tons in 1989 to 4 million tons in 1993 and 3.3 million tons in 1995. 4 GDP fell over 40 percent during the same period. Imports were brought down from $8.1 billion in 1989 to $2.2 billion and the trade deficit was kept low, in line with the meager external financing. Though they decided to make the necessary changes to face the crisis, Cuban policy makers expressed that they will maintain the socialist orientation of the system. Insufficient or dramatic, the government usually ends up enacting too-little-too-late changes, generating further imbalances which in turn lead to more reforms. In the face of the massive contraction of export revenues, the Cuban government relied on a set of measures designed to mitigate the social impact of the adjustment. These measures have generated important economic disequilibria, which at the same time are promoting further reforms. Thus, as a centrally planned economy, Cuba reacted to the sudden shortage of foreign exchange not by devaluing, but by rationing foreign exchange and administratively distributing dollars to different sectors. In spite of the objectives of the Cuban government, the use of this arbitrary process as a substitute for devaluation has generated serious inefficiencies and Cuba is paying their cost. On the one hand, since products are neither more expensive nor more profitable— as would have happened with devaluation— shortages develop as output contracts and demand grows at the set low prices. In other words, the system does not generate the price incentives to produce or save dollars. Imports are extremely cheap at the distorted official exchange rate of 1 peso per 1 US dollar. Given the government reluctance to devalue, Cubans were left with more purchasing power— measured at the official prices— than the actual supply of goods which they had available. This led to greater rationing and higher black market prices for goods. 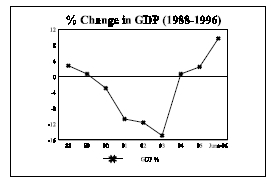 Also insufficient adjustment led to a fiscal deficit that reached 40 percent of GDP in 1993. The government could not stop spending, while exports, the economy, and fiscal revenues were collapsing. Given the absence of external financing and of internal capital markets, the government had very little choice but to cover the deficit by printing money. As a consequence, the economy was flooded with liquidity. The number of pesos in circulation increased from 5 billion in 1990 to 11.4 billion in 1994. In a market economy, excess liquidity creates inflation. In a centrally planned economy the effects are different. Since official prices do not change and people have more money to spend than products to buy, huge shortages and black markets develop. 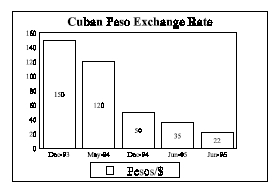 By the end of 1993 the official exchange rate was 1 peso per U.S. dollar, while it reached 150 pesos per dollar in the black market. In 1993, the government finally realized that the solution to the crisis was not to be found in cosmetic changes made at the periphery of the system. In contrast, it would require profound revisions of the socialist order and also of its incentive structure. Since then, a sequence of reforms has characterized the period from 1993 to date. Among others, the legalization of hard currency, the creation of agricultural cooperatives, the introduction of monetary incentives to increase labor productivity, the opening of free markets for farmers and artisans, the legalization of the creation of foreign firms with 100 percent foreign capital, the authorization of free zones; and the liberalization of 157 economic activities to be performed by self-employed workers, are some of the expression of the revision that the government of Cuba has made at all levels. The Cuban economy is recovering. After suffering a 40 percent decline in GDP over four years (19891993), it touched bottom in 1993 and has been recuperating ever since. After timid growth of 0.7 percent in 1994 and 2.5 percent in 1995, the prospects for this year are more ambitious after the announced 9.7 percent growth for the first semester of 1996. 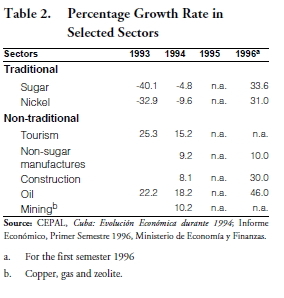 According to the 1994 ECLAC report, 18 industrial sectors grew during the 1993-94 period. For the first time, tourism displaced sugar as the principal source of foreign exchange, providing US $800 million in 1994, which represented 35 percent of Cuba’s total hard currency revenue. Evidently the economy has adjusted to a lower level of activity. GDP stopped contracting in 1994 thanks to the expansion in new activities such as tourism, mining, oil, and non-sugar manufacturing. Foreign investment in these new activities has also been growing. For 1996, due to important growth in all sectors of the economy— including traditional ones such as sugar and nickel, which were until now holding back the GDP rebound— predictions are for an estimated 7 percent increase in GDP for the year. The sugar harvest of 1996 is only one of the many good examples of hard currency salary incentives increasing labor productivity. 10 Around 400,000 workers in the sugar industry alone receive dollar incentives for meeting or exceeding their work quotas. According to official estimates, around one million workers, 25 percent of the labor force, is now receiving some form of payment in dollars. Another good sign in the economy has been the recovery of the peso. After reaching 150 pesos per dollar in 1993, it began to fall until December 1995, when it stabilized at 22 per dollar. In spite of that important recovery, the situation is still far from stable. The huge distortions generated by the differences between the official and the unofficial rates are responsible for significant inefficiencies in the allocation of resources. For example, since income in dollars represents 22 times more purchasing power than income in pesos, there has been a mass exodus of university professionals to less skilled activities that provide dollar remuneration. In order to recover the standard of living of the average Cuban in 1988, the economy will have to grow for eight years in a row at a rate of seven percent. To substitute the foreign exchange earnings from sugar and nickel that Cuba had in the 1980s, tourism would have to grow from one million to about three million tourists per year. Over one billion dollars more in foreign investment would be needed to boost tourism to those levels. Hence, while the economy has stopped contracting, it has done so at a very decreased level of income which will take a long time to reverse. Nevertheless, the economy has reacted with a dynamism that shows no signs of fatigue yet. New reforms have been announced in an attempt to solve the increasing contradictions between the new, market-oriented sectors of the economy and the controlled, centrally planned, socialist economy. In other words, the system has developed a dynamic of its own, which has been forcing the government to make more changes than originally planned. We believe that those changes will bring more economic freedom and with it, undesirable inequality. In this context, the Cuban government will be increasingly exposed to political challenge arising from social tensions. The following are some examples of how this scenario is developing. As consequences of the reforms to attract tourism and foreign investment, the dollar economy began to expand and black market activities boomed. Since illegal transactions in dollars became common practice among Cubans, the government had no choice but to legalize dollar holdings. On July 26th, 1993, Fidel Castro made the following historic statement: “today life, reality … forces us to do what we would have never done otherwise. …we must make concessions.” Among others, he made the following announcements: 1) Cubans would be permitted to have foreign currency and to spend it in special stores; 2) the government would introduce a national currency which would be convertible (this commitment was made effective in December 1994); 3) bank accounts in dollars would become legal; and 4) Cubans could pay for the services of other Cubans in dollars. The objectives of these measures were to eliminate the hard currency black market and to stimulate dollar remittances from families abroad. 11 Different sources estimate dollar remittances from Cubans in exile to be in the vicinity of US$500 million annually, despite the controls imposed by the U.S. government. The reforms have resulted in important inequalities between those who have access to dollars and those who only have pesos. There are two Cubas, drifting apart; they live different lives and hope for different things. Nevertheless, the good news is that the number of Cubans participating in the dollar economy has been constantly growing since the legalization of hard currency. Subsequent reforms designed to expand the dollar economy, such as authorizing farmers and self-employed to charge in dollars or pesos, are the principal causes of the increase. According to a government survey, the amount of foreign currency in the hands of the population is increasing substantially. Before 1989, it was the Soviet Union who provided Cuba with the hard currency and the technology it needed to support the economy. Now the Cuban government relies on foreign investment for such purposes. However, Cubans fear becoming once again overly dependent on any one country or sector. If the Cuban government has shown firm commitment to anything since the beginning of the economic crisis, it has been to attracting investors from as many countries as possible to bring their dollars to Cuba. Different sources suggest that foreign investment agreements for around 2 billion U.S. dollars— up to the year 2005— have been signed between the Cuban government and investors from over 15 countries, including Australia, Canada, France, Germany, Great Britain, Israel, Italy, Mexico, Spain and others. Originally, the government intended to attract foreign investment only in tourism; this was seen as the safest way to keep the capitalist exercise limited to a peripheral activity. Reality though, forced Cuba to open other sectors to private capital in the search for new technologies and hard currency. The most widely opened sectors behind tourism are: agriculture (mainly tobacco and citrus), mining (nickel, lead, old and chrome), oil and coal, telecommunications and textiles. Cuba has signed investment protection agreements with most investor countries guaranteeing equal treatment, abstention from nationalization, and the right to repatriate profits and capital. With the objective of attracting more private capital, the new foreign investment law, enacted in September 1995, allows 100 percent private ownership. It also permits investment in real estate and the creation of free trade and export manufacturing zones. Discussions in the National Assembly over the Foreign Investment Law were heated. The two most controversial features of the bill were: a) allowing Cuban exiles to invest in Cuba with the same rights as other foreign investors; and b) allowing foreign companies to hire employees directly. Only the former was approved. The system may change in the future in response to the growing criticism from abroad. Except in special free trade zones, foreign companies can only hire Cuban workers through a government agency, ACOREC, which assigns workers according to the individual qualifications and also keeps the dollar salary, paying the employees in pesos. Since the official exchange rate is still one peso per U.S. dollar, workers consider this policy sheer robbery. They would not mind paying the 20 percent tax that the government has instituted if they could exchange their dollars at the unofficial exchange rate. Because they cannot, workers consider the income tax an insult to injury, especially after the government opened exchange houses where they were allowed to buy back their dollars, but at the unofficial (much higher) exchange rate. The impact of the Helms-Burton Act has yet to be seen. Cuban officials are expecting a slowdown in foreign investment, especially for the second semester of 1996. The recent fiscal reform has also been highly controversial. Reductions in the fiscal deficit required the introduction of some very unpopular measures. The fiscal gap was reduced from 40 percent of GDP in 1993 to 12 percent in 1994 and 9 percent in 1995. In order to obtain these results, the government had to widen its sources of income and at the same time reduce expenditures, especially subsidies and salaries. On the income side, taxes were increased by 24 percent. A new income tax was imposed on the self-employed, farmers and cooperative members. There was an substantial increase in prices of some goods and services such as tobacco, liquor, electricity, 13 transportation, gas and mail services, among others. On the expenditures side, there was a reduction of nine percent, achieved by a major cut in the size of the central government: 15 ministries were eliminated and many subsidies in education and health were A social security contribution of up to 12 percent of wages was introduced in early 1995 to pay for the country’s financially onerous pensions. It took more than two years for the members of the National Assembly to agree on the need to reinstate taxes. The debate, long known to capitalist societies, is still in its infancy in Cuba. The reforms adopted to date are not enough, and there is an agreement among some high Cuban government officials that a more comprehensive tax reform is needed in the future. It is obvious that the political viability of this policy will depend on the development of a profitable private sector. The size to which this private sector should be allowed to grow is also a source of debate. Since 1990, the Cuban government has constantly emphasized the significance of foreign investment in stimulating the economy and in accessing dearlyneeded hard currency. Big corporations, mainly joint ventures between foreign investors— including Cubans in exile— and the government, are doing business on the island. But local Cubans are not allowed to do so because their businesses are limited by law to the very small scale. Part of the success in the arena of fiscal policy has been the reduction of the deficit by decreasing expenditures, cutting costs, and decentralizing and reducing the size of the central government. By allowing self-employment, the government has provided job opportunities to those laid off from public enterprises. According to some estimates, close to one million people out of the total work force of four million must be laid off in order for state enterprises to become efficient. Ricardo Alarcón, president of the National Assembly, said that expanding self-employment was the “logical solution to unemployment.” The second objective, less politically correct and also less publicized, is to incorporate more Cubans into the dollar economy. Increasing tensions between the dollar and the peso economy have led to social discontent and frustration. While doctors, members of the armed forces, and educators wonder why they are earning 20 times less than the self-employed, the government tries to find ways to close the uncomfortable gap. The policy thus far has been to expand the number of services and activities authorized to be offered by the self-employed. Finally, the legalization of self-employment also has the objective of increasing fiscal income by widening the tax base. 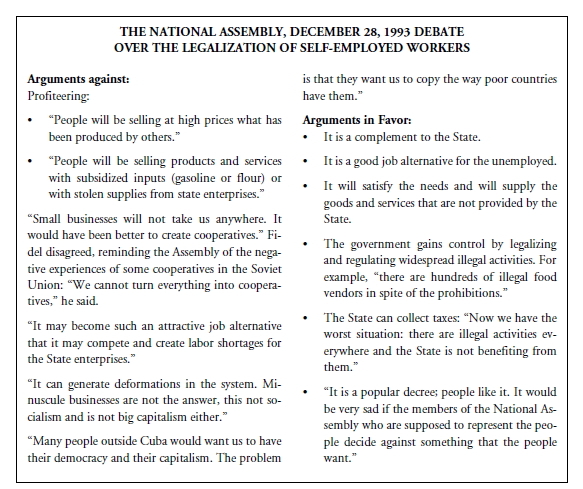 In other words, the change in government policy towards the self-employed in Cuba is driven by three elements: a) the increase in the number of workers who are and will be unemployed; b) the need to bridge the growing inequalities between the peso and the dollar economy by providing dollars to those who can earn them; and c) the need to increase fiscal revenues. This last objective is being achieved by not only expanding the number of self-employed but also by introducing a highly controversial tax reform. Unfortunately, increasing tax rates limit the government’s ability to address the first two factors, and the number of self-employed workers is shrinking for the first time. According to different sources, there were between 110,000 and 160,000 self-employed workers in Cuba by December 1994. Pedro Ross, President of the Confederation of Cuban Workers, said that out of the 2.2 million persons employed by public enterprises, 500,000 could be “pushed out of their jobs and encouraged to become self-employed.” Further, around 80,000 Cubans who join the labor force every year will consider self-employment as an option. By the end of 1995, the number of Cubans with self-employment permits reached approximately 208,000 workers, over 5 percent of the island’s labor force of four million. Also, according to some official estimates, another 200,000 persons are working in similar activities but without licenses. In June 1996, the Government authorized 40 new occupations for self-employment but increased the monthly flat fee that it charges for carrying out each occupation. The schedule of fees, which when established in 1993 ranged from zero (exempted or free) to a maximum of eighty pesos per month, changed to a new range of from ten to four hundred pesos per month. The most successful activities have been taxed with the highest fees. Also, university graduates — previously banned from participating in any activity as self-employed— have been recently allowed to do so. Unfortunately, they are restricted to the 157 legalized activities and may not be self-employed in their field. This new decision is an attempt to alleviate the increasing discontent of some of the traditional elite who feel unjustly left out. nurses, doctors and professors — that has been traditionally provided by the State. The government’s justification for excluding these fields is that these professionals have a duty to pay back to society what the system has invested in their education. allowed to enter the system and the authorized activities have been expanded. Though not yet the majority, there is an increasing number of Cubans engaged in economic activities that did not even exist three years ago. According to government officials, there are approximately 500,000 Cubans working in activities related to self-employment activity. Another half million are receiving dollar incentives from the big government enterprises and thousands are earning dollars in activities related with the tourism industry. They all represent a growing constituency for the reforms. Furthermore, the huge spread between the official and unofficial exchange rate is pushing the government to incorporate more Cubans into the dollar economy. The structure of the Cuban economy has undergone a transformation which guarantees a period of growth. Nevertheless, the dual nature— a dollar and a peso economy— of this structure is generating social tensions and growing inequalities. All of these bottlenecks will have to be resolved in the near future. Further reforms must tackle the current restrictions, since they are badly needed for the private sector to grow. And this time around, the good health of the government depends on the survival of the entrepreneur. In spite of previous setbacks in Cuba’s reform attempts, this time around the Cuban private sector is here to stay. Without the generosity of the Soviet Union, there is no choice left for Cuba but to become more efficient and to insert itself into the international system. In contrast with earlier attempts at reform— which were reversed with ideological rhetoric and Soviet help— the reforms of the 1990s are sustained by a growing constituency, both foreign and local, with market oriented objectives. This constituency, in contrast with the former experiences, continues to push the reforms forward toward greater liberalization. The government, on the other hand, cannot survive without the dollars and the taxes provided by this emerging private sector. The Cuban government is committed to Marxism and also to preserving the egalitarian society which was forged by almost four decades of socialism. In such efforts, important reforms such as foreign exchange unification, have been delayed in order to mitigate their negative social impact. Paradoxically, in spite of all these efforts, Cuba’s social tensions have increased and political discontent exacerbated. The coexistence of two exchange rates has caused enormous distortions, making those earning dollars significantly richer than those trapped in the stagnant peso economy. The self-employed, the owners of the paladares, the farmers, and the artisans are leaping at the opportunities with the hope of a better life. Others, like doctors, educators, scientists, and artists, who have sacrificed years climbing up the traditional socialist ladder, feel unjustly left behind. In order to ease this increasing tension, the government has been steadily expanding the areas where private activities are allowed: the more Cubans that have access to dollars, the better. This government objective though, is being limited by significant bottlenecks that restrict the growth of the private economy. New reforms can be expected in these areas in the future. The most sorely needed changes are the following: the unification of the exchange rate, the liberalization of the supply market for the self-employed, the creation of small and medium size enterprises, bank reform (to permit the financing of small businesses and access to credit), and a labor reform legalizing the hiring of non-family employees. Thanks to the reforms introduced to date, the Cuban economy has touched bottom. It is now growing and will continue to grow. After coping with the crisis, Cubans face the daunting task of managing growth. In the midst of great economic distortions, the principal challenge ahead is to resolve the increasing social tensions that accompany them. The achievements of the old system are eroding, while the benefits of the reforms are timidly emerging through the cracks of socialism. This fragile equilibrium is driving more reform and liberalization. How fast Cuba will proceed and what shape its emerging economic system will take is still a puzzle for all.